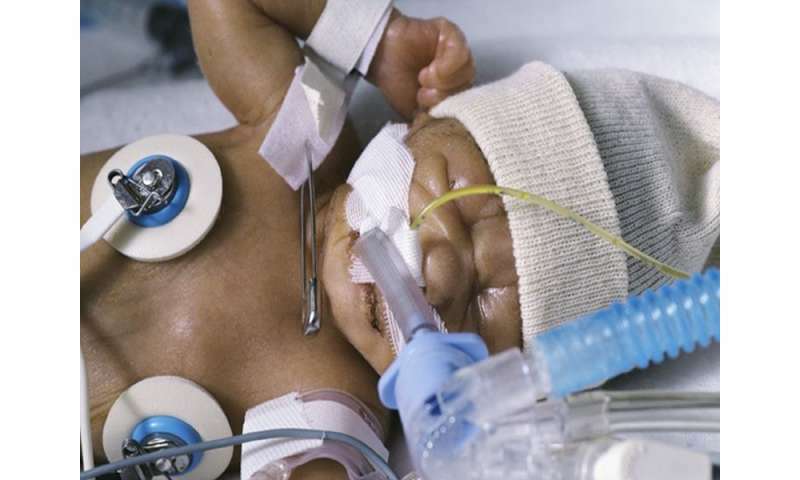 (HealthDay)—Different target ranges for oxygen saturation as measured by pulse oximetry (SpO2) do not affect the composite primary outcome of death or major disability for extremely preterm infants, according to research published in the June 5 issue of the Journal of the American Medical Association. Lisa M. Askie, Ph.D., from the University of Sydney, and colleagues conducted a prospectively planned meta-analysis of individual participant data from five randomized clinical trials involving infants born before 28 weeks' gestation. Participants were randomized to lower (85 to 89 percent; 2,480 infants) or higher (91 to 95 percent; 2,485 infants) target ranges for SpO2. The researchers found that the primary outcome (composite of death or disability at a corrected age of 18 to 24 months) occurred in 53.5 and 51.6 percent of the lower and higher SpO2 target groups, respectively (relative risk, 1.04; 95 percent confidence interval, 0.98 to 1.09; P = 0.21). Death occurred in 19.9 and 17.1 percent of infants in the lower and higher SpO2 groups, respectively (relative risk, 1.17; 95 percent confidence interval, 1.04 to 1.31; P = 0.01). Severe necrotizing enterocolitis occurred in significantly more infants in the lower SpO2 target group. "There was no significant difference between a lower SpO2 target range compared with a higher SpO2 target range on the primary composite outcome of death or major disability at a corrected age of 18 to 24 months," the authors write.